Termite queens have an efficient antioxidant system which may underpin their ability to live longer than non-reproductive termites, according to a study published January 11, 2017 in the open-access journal PLOS ONE by Eisuke Tasaki from Tottori and Yamaguchi Universities, Japan, and colleagues. Unlike most animals, the queens of social insects such as termites can live for a long time without sacrificing their ability to produce many offspring. 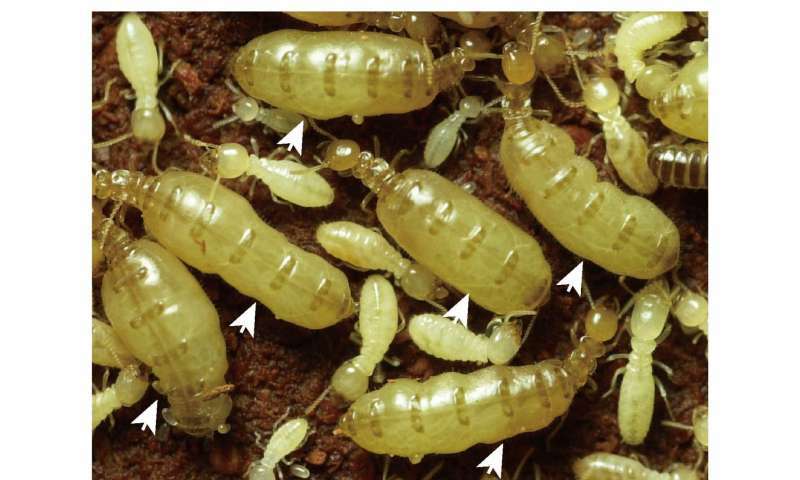 The authors of the present study examined samples of the Japanese termite, Reticulitermes speratus, comparing queens to non-reproductive workers. They measured levels of oxidative damage markers and assessed enzyme expression and activity to look for possible anti-aging mechanisms underlying such longevity. The researchers found that termite queens had lower levels of markers of oxidative damage to DNA, proteins and lipids compared to workers. The queens showed higher expression levels of two genes encoding key antioxidative enzymes catalase and peroxiredoxin, with catalase also showing higher activity levels in queens compared to non-reproductive termites. The authors therefore suggest that an efficient antioxidant system operates in queen termites, with enzymes providing higher resistance to oxidative damage. This may act as an anti-aging mechanism, enabling queens to live longer than other termites despite very high fertility.